Matisse’s The Painter and His Model—in the exhibition devoted to his work at the Eykyn Maclean Gallery in New York—is a candy box of a composition, a hymn to rococo excess. 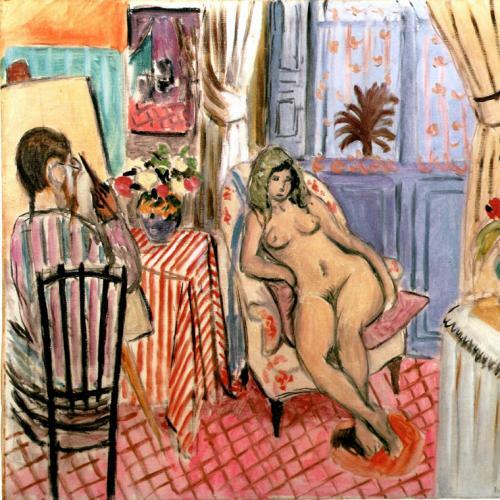 Set in a room in Nice overlooking the Mediterranean, Matisse’s fairytale canvas is jam-packed with incident, a crowded interior rendered with oil colors thinned to the translucency of watercolor. The light is soft, suggesting honey or champagne. The interior, more cozy than grand, feels just right for the languor of long mornings and afternoons, except that the artist is hard at work at his easel, painting the model seated in a chair. The artist, of course, is Matisse himself, with his bearded, bespectacled face turned toward the young woman. World War I is over. A new decade is beginning. And Matisse, who only a few years before had solidified a reputation among the avant-garde as the great simplifier, is now turning himself into the great complicator in this intricate little picture that is just under two feet high. There is still, of course, Matisse’s power of design, with the bewildering richness of patterns mosaicked together as forcefully as the elements in a Persian miniature. But the composition’s underlying architecture is not stressed, as Matisse would have done a few years earlier. The silken, golden vision is meant to feel as if brought together by accident, with the vehemence of Matisse’s earlier work giving way to a meandering attentiveness that settles now here, now there. The model is solid yet fragile, like a figure in a painting by Watteau. Matisse takes his colors from the reds, pinks, and purples of the flowers displayed in a green vase. I find myself thinking of fresh berries devoured on a summer afternoon. Looking at the savage simplicities of Matisse’s The Dance in 1909, few could have predicted how strenuously he would pursue elaboration a decade later. And although there is no period in Matisse’s career that has not found its admirers, his shifts of direction remain for many a conundrum, if not an embarrassment. Why, some have wondered, did this great modernist choose to wander through what now look like the byways of postmodernism? Toward the end of his life—in the text for Jazz, the book of cut paper compositions published in 1947—Matisse tried to explain his restlessness to a public he knew sometimes wished he had been less various. “An artist,” he said, “must never be a prisoner even of himself, a prisoner of a style, a prisoner of a reputation, a prisoner of good fortune.” With The Painter and His Model, the great simplifier turned a corner. He would turn many more in his career. Of course a masterwork such as this is what it is and needs no further justification. But for Matisse The Painter and His Model was surely, among many other things, a rejection of historical inevitability—of the idea that the history of art had been inexorably shaped by the radical simplicity he himself had recently embraced. With The Painter and His Model Matisse also rejected any thought that his own history had some inevitable shape or trajectory. Art, so he believed, was not a way of defining the coherence of one’s personality but a way of exploring the variety of one’s personality. He insisted on discovering radically different aspects of himself through his radically different styles. He would not be imprisoned. In Jazz, Matisse recalled that the Goncourt Brothers—whose wide-ranging enthusiasms included eighteenth-century French painting, Asian decorative arts, and the naturalistic novel—“tell us that Japanese artists of the great period changed their names several times in their lifetimes.” This pleased Matisse, who concluded that the artists “wanted to safeguard their liberties.” Matisse’s restlessness remains a challenge, even to some of his most fervent admirers. In a world where everybody craves singular conclusions, Matisse bids us to draw multiple conclusions. Whatever he does, he does full out—extremely. He entertains a multiplicity of extremes. And in doing so he achieves, paradoxically, a kind of moderation.